A Story I Tell: storyteller Helen East chooses the whale story she most likes telling, her version of 'The Narwhal', a story of need and greed. This is one of many episodes in an origin myth from the Inuit people of Greenland a story from the 'deep time' when the world was still ‘settling’. I tell this story is because it arises out of a subsistence way of life in which every creature that can be eaten is essential food, including the whale. But with this comes the need to preserve a balance of when and how to hunt so the hunted will also survive. Central to this is the belief that we can kill only because of need, not greed. And it is the Grandmother’s greed that is the real crime. It needs to be remembered, too, that in Inuit society, it was felt to be important not to become a burden on the whole community. Elders who had become too weak to take on responsibilities were expected to ‘go walkabout’ in times of disaster when there was not enough food to go around. In the bare bones of winter only the strongest survive. In the worst winter of way back time, not many were left alive. Those who could, moved on, to see what food they could find. An old woman, her grand-daughter and little brother Tutigat, who was blind. The grandmother tried to lose Tutigat, but his sister wouldn’t let him go. When a bear attacked them, his sister helped him aim the bow. and secretly cut and cooked the meat, when she thought that he had gone to sleep. He knew that she was lying; he heard the water boiling; he smelt the bear meat cooking. In the story, Tutligat's sister saves him from starving. She is then forced to abandon him by a lake, although she leaves him stone way-markers. A goose comes to help him out by dunking him under water, and miraculously, he gains his sight. Now, as he joins his grandmother and sister again, the roles are reversed between them. “Let’s see what we can catch!” said the boy. This time he led the way. Winter had eased and it was the white whales season. They came to a sea break where several were swimming off- shore. Taking up his harpoon, Tutigat tied the end of the line around his sister, so she could act as ‘anchor’. “You have always shared with me,” he said. Now you can be my ‘whale’s tail.’"
The girl was delighted because this meant that she was partner in the hunt, with equal shares in the catch. She settled herself firmly on the shore-ice, and soon her brother had harpooned a small whale which they easily hauled inland. Now there was food, but the grandmother said “One more! One more! And let me be the whale-tail now!” for she wanted to be sure of her share too. This time there was a bigger whale - a beluga - but it was further out. Then Tutigat took aim, and threw the harpoon. The whale was wounded, and it pulled on the line. The old woman began to slip. She tried to grab hold of the girl, but at that moment the line jerked hard. Grandmother skidded, slid across the ice and shot into the water. The sea sucked her in, spinning her round and round, and then spewing her out. As she surfaced with a gasp like a whale’s spout, they saw her hair had whirled into a long white twist like a tusk. Her skin was dark and leathery with cold. Her shape was smoothing out – streamlining. Then the whale dived down and down she went. Deep, deep, deep. Down she went for ever. That’s how it happened, that’s how she changed. She became the black narwhal, with the white tusk that glints when it catches the sun. That’s how it happened, way back then. A version of this folktale, collated from two sources in Labrador, and six from different parts of Greenland, appears in Henry Rink’s Tales and Traditions of the Eskimo, with a sketch of their Habits, Religion, Language and other Peculiarities, published in London in 1875. Another version is in Howard Norman’s Northern Tales, from a translation by Severance Rosegood of a story told by Pioopiula in 1975. Helen East is an author, storyteller and creator of story artifacts. Born in Sri Lanka, she has lived and toured worldwide, using story to promote environmental awareness and celebrate the spirit of place. 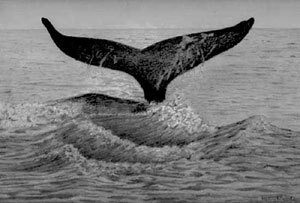 The drawing of the whale above is by and copyright of Nancy Nichols. 'The Narwhal' engraving is by the zoologist George Shaw (English, 1751 - 1813). published in 2009 In the bare bones of winter only the strongest survive. Down she went for ever.